As Christmas is around the corner, every year I get all my Christmas decorations to decorate my home for Christmas. I really have good time when I see again my quilted Christmas decoration I’ve made for my home, I’ve shared some tutorials before so you all can make them too, but I shared them on a blog I used to have, for some technical issues I had to start this new blog with WordPress and those tutorials are no longer for you on the internet, but I would like to share them again on this blog, so if you want to make them feel free to download the free pattern and make it as many times as you want to, as this Christmas tree mini quilt could be make in one day and it would be a perfect Christmas present for anyone who loves quilts. You need to click on the image here to download and print out the pattern. Cut all the pieces you need for the quilt. You can use your rotary cutter and your rotary cutting mat. 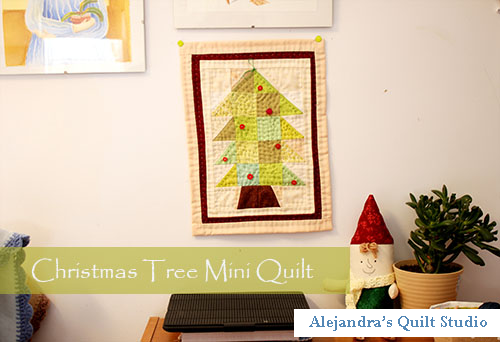 Note: to make the Christmas tree trunk, you will work on two white or light beige squares of fabric with Paper Piecing technique, once you made them, press each square . 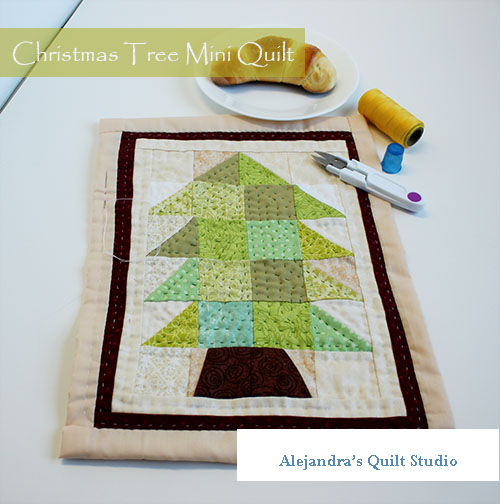 When you get all your pieces ready the first thing you need to do will be to sew together one green triangle to a white or light beige triangle, so you can make all the 10 squares for the tree made out with two triangles each one, press each square. By this moment you might have all your squares ready to make the mini quilt top, you need to follow the image on the pattern and sew together the squares to make each one of the rows. When you get all the rows made, press each one of them, and now you can sew each row to the next one according to the order on the pattern. Press the top. You will need a strip of white or light beige 1 1/4″ wide X the long on the two sides, sew each strip to each side of the mini quilt, press. You will need now two strips white or light beige, of 1 1/4″ X the long of the top and the bottom of the mini quilt, sew one strip on the top and one strip on the bottom, press. With a red fabric, now you will need a strip of 1 1/4″ X the long on the two sides of the mini quilt top and sew one strip on each side of the top, press. You will need now two strips of red fabric 1 1/4″ X the tong of the bottom and the top of the top, sew one strip on the bottom and one strip on the top of your mini quilt top, press. As your top is finished, you need to place it on the batting fabric and cut a piece, one inch bigger on each side of the top. Hold the two fabrics together with safety pins. Your mini quilt is ready to be quilted. You can quilt your mini quilt like I did by hand or you can quilt it by machine, I’m sure you will do a great quilting job. Once you finish the quilting, you will need to trip the batting fabric, the mini quilt top will guide you to trip the batting. Now you can trim the fabric for the back one inch bigger on each side of the mini quilt, and you can finish your mini quilt by folding the fabric for the back as it was a bias and sew it on the mini quilt by hand or by machine. Add some red buttons on the tree to add some Christmas decorations, you can also add a red ribbon on the top of the tree. 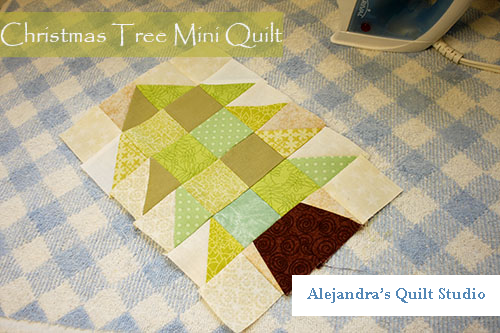 Step back and admire your finished mini quilt! 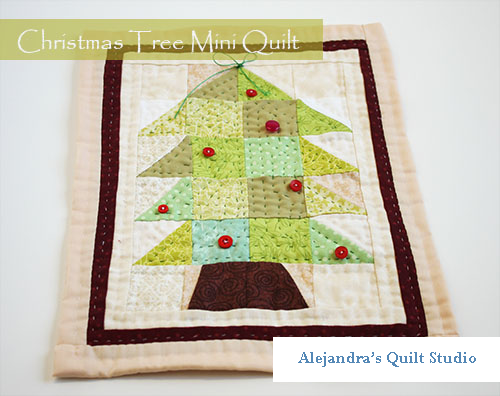 If you have any questions about this Christmas Tree mini quilt tutorial, leave a comment here on the blog or on my Facebook page at Alejandra’s Quilt Studio. 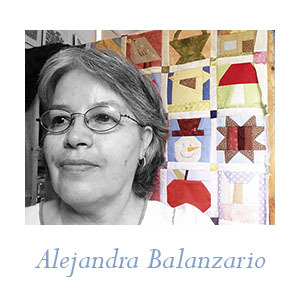 If you make this mini quilt you can share a picture of it on Alejandra’s Quilt Studio Facebook page on a comment so we can take a look at it, if you make it and you share your mini quilt on your blog or on your Social Media, pleas share a link to my blog and give me the credit. Don’t forget to add your name to my new letter or like my page on Facebook so you can be the first one to know about my new work! 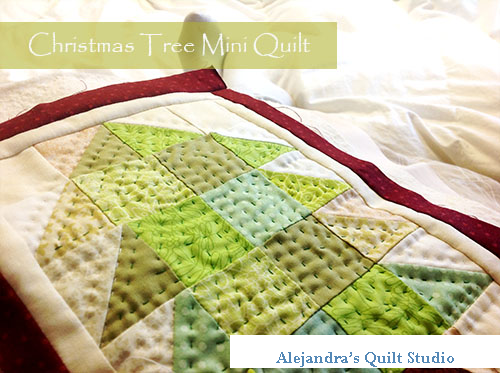 Christmas mini quilts are my favorites!